This project originally appeared in an issue of my newsletter. Speaking of which…. I know I am terribly overdue to put one out! First I was thinking I’d do one for mid-June, then I thought mid-July…. and now I’m thinking, maybe August?? Here is my problem- I’m not that good at focus and multi-tasking! For the last week or so, I have been focused on doing new artwork, painting and spending a lot of time in PhotoShop. When I get in this “zone,” I tend to have tunnel vision- doing blog posts, working on my newsletter, and posting stuff on Facebook or even hunting around Pinterest aren’t on my “radar.” I have a hard time splitting up my days- I find that once I get started on something, say artwork, it’s really difficult for me to switch gears and work on something else like social media (or cooking or cleaning! true story!) And vice versa- I can go weeks without creating any new art because I am in “social media” mode, or “domestic goddess” mode….. I think maybe, I tend to go into “tunnel-vision” mode because I am so prone to having my thoughts ping-ponging all over the place, that I subconsciously block everything else out. The problem is, I sometimes have a hard time getting back to those other necessary things in a timely manner. Can anyone else relate? Is this a woman/estrogen thing? Or am I just weird??? 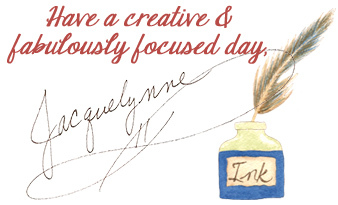 So anyway….. I’m sure you’re tired of hearing about my brain… onto our project for today! Paint pencils their base color. You will probably need to give them at least 2 coats of paint. Balance them on the top of a glass while they dry so that they don’t stick to anything. When they are dried, paint stripes. 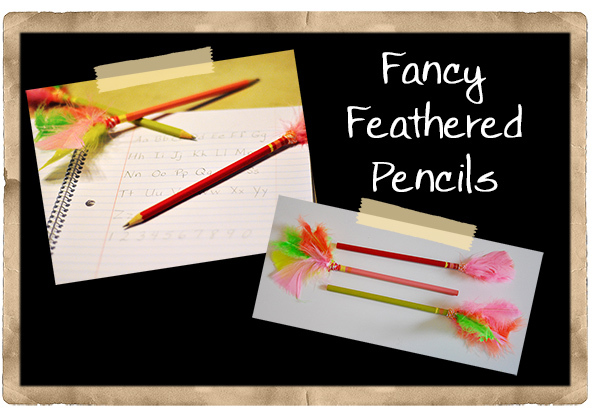 Pick how many feathers you would like on the top of your pencil and test out how they will look so you know where to glue them. If they are a little too fabulous, trim the feathers at the bottom. Arrange the feathers on the pencil, and then spread your glue over top of their bases. Quickly start twisting the twine over the glue as tightly as you can. Trim your twine and secure the end with a little glue. Let dry. What do you do to keep the kids busy all summer? This article was posted in Crafts & DIY. Bookmark the permalink. Follow comments with the RSS feed for this post.Post a Comment or leave a trackback: Trackback URL. Love these pencils – the kids would love having these and would probably be the envy of their classmates when school restarts. We spend most of our time at the pool in the summer, but I may have to try this craft project on a rainy day. Great rainy day project! And if you live on the East Coast like I do- you need a LOT of rainy day projects this summer!! Love this idea! When we homeschooled we used to have special pencils when we could find some to put in the “prize” box….baseball theme, monster erasers, etc. This is even better!